Kim Yo Jong, Kim’s younger sister and a key player in his secretive regime, will arrive in South Korea as part of North Korea’s 22-member government delegation that will attend the opening ceremony of the Winter Olympics. SEOUL, South Korea — The only sister of the North Korean leader, Kim Jong Un, will visit South Korea this week, the first immediate member of the North’s ruling family to set foot in the South, officials said Wednesday. Kim Yo Jong, Kim’s younger sister and a key player in his secretive regime, will arrive in South Korea on Friday as part of North Korea’s 22-member government delegation that will attend the opening ceremony of the Winter Olympics later that day. The North Korean delegation’s three-day itinerary includes a meeting with President Moon Jae-in of the South. Her bloodline gives her an unmatched status among North Korean elites. She is also considered Kim’s closest relative. The South Korean news media calls her “Kim Jong Un’s Ivanka,” likening her influence with her brother to that of Ivanka Trump’s on her father, President Donald Trump. The North’s state news media often show top-ranking officials listening reverentially when Kim Yo Jong speaks. She will be attending a spectacle that is also drawing Vice President Mike Pence, who will be at the opening ceremony Friday, and Ivanka Trump, who is expected at the closing ceremony. The gathering is prompting speculation about some previously unthinkable get-togethers. The North’s delegation is officially led by Kim Yong Nam, 90, the president of the Presidium of the North’s Parliament and the country’s nominal head of state. But being a sister of Kim Jong Un, North Korea’s “monolithic” leader, Kim Yo Jong will become the focus of intense attention. It remains unclear whether Kim Yo Jong or any other North Korean official will be carrying any message to Moon from Kim. The South Korean president has been eager to use the North’s Olympic participation as a way to ease tensions spurred by its nuclear and missile tests in the past year. Kim Yo Jong, 30, has emerged as an important player in her brother’s government since Kim replaced their father, Kim Jong Il, as supreme leader in 2011. She is believed to be a deputy director of the ruling Workers’ Party’s Department of Propaganda and Agitation, a key post in the propaganda-heavy totalitarian state. She is the only relative of her brother who appears in North Korea’s news media, accompanying her brother in state ceremonies or in his “guidance tours” of factories and farms. She is often seen carrying texts of Kim’s speeches or standing in the background, smiling and even frolicking, while other senior grim-faced officials stand close to Kim in reverence and fear. Kim has an older brother, Kim Jong Chol, who has never been seen in the North Korean media and whose role, if any, remains a mystery. He was last seen at an Eric Clapton concert in London in 2015, but little else is known of him. 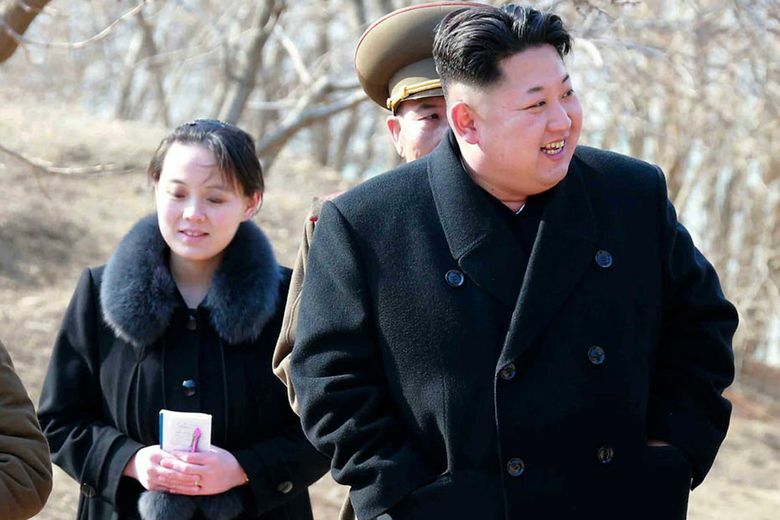 Kim Yo Jong and her brothers studied in Switzerland as teenagers. Kim Jong Un’s older half brother, Kim Jong Nam, was killed in an airport in Kuala Lumpur, Malaysia, in February last year by two women who smeared his face with a rare nerve agent. The assassins, who are on trial, were hired by North Korean agents who analysts said were sent by Kim Jong Un to eliminate a potential threat to his dynastic grip on power. Outside officials and analysts consider Kim Yo Jong the pre-eminent female face of the Kim family, which has ruled North Korea since its founding seven decades ago. Her father, Kim Jong Il, also allowed his own sister, Kim Kyong Hui, to hold prominent jobs in the government until his death in 2011. But she disappeared from view after her husband, Jang Song Thaek, was executed in 2013 by Kim Jong Un on charges of plotting a coup. Word of Kim Yo Jong’s visit came as Pence warned North Korea that it would face a new round of tougher sanctions. “The United States of America will soon unveil the toughest and most aggressive round of economic sanctions on North Korea ever — and we will continue to isolate North Korea until it abandons its nuclear- and ballistic-missile programs once and for all,” he said Wednesday while visiting Japan. Pence has embarked on a set of symbolic visits designed to draw attention to the North’s terrible human-rights record and nuclear aggression. With determined rhetoric — and the promise of more “aggressive” economic sanctions against the North — Pence is looking to refocus American allies on the North Korean threat. Pence arrives in Seoul on Thursday for meetings with Moon. Aides say the vice president is advancing a counter message, using the games as an opportunity for the South and the broader international community to exert what President Donald Trump has termed “maximum pressure” against the North. Pence’s strenuous efforts to highlight the threat from the North and its human-rights record present a dilemma for Moon. The South Korean leader has long advocated engagement with the North and sees the Olympics as an opportunity to quell tensions that have escalated over its nuclear program. He has limited room to maneuver as his guest from Washington strongly criticizes the North and emphasizes the need to crank up the pressure campaign. In South Korea, Pence is scheduled to meet Friday with North Korean defectors as he pays respects at the Cheonan Memorial in Seoul, which honors the 46 South Korean sailors killed in a 2010 torpedo attack attributed to the North. Pence’s personal guest at the games will be Fred Warmbier, the father of Otto Warmbier, an American who died last year days after his release from captivity in North Korea.